So, another month passes into the abyss of the past and still no market news... Except that I plan to visit family up on the north coast of NSW in a month or two and do a couple of markets up there, maybe The Channon and Bangalow? OK, that was a pretty pathetic attempt to maintain a shred of self-dignity. April was rather nice really, unseasonably warm (one of the up-sides of climate change!) and generally containing some notably pleasant events. I did get older, entering a new realm of numbers which is best not to contemplate, but managed to do my best to ignore it. I went on a couple of camping trips to celebrate in the most subdued way possible, both of which were very enjoyable. The first was to a place called Wee Jasper, kind of near Canberra. Considering its size, it has a hilarious number of websites devoted to it, presumably created to lure in visitors by the tiny number of locals who must live there. It is, however, quite lovely, even if the camping is not quite the "real bush camping" promoted by one of the aforementioned sites. The camp areas are more like large fields, with amenities blocks with luxuries like flushing toilets that generally allude one in the bush. It was during the school holidays that we went, and I kind of assumed it would be crawling with people, but fortunately it was pretty quiet in our camping field of choice, having only a small group of Scouts camping across the other side of the field. Our group consisted of me, my brother and sister and their respective partners and children (hence the school holiday timing). We were actually much louder than the poor Scouts, who must have gritted their teeth as we rolled in to the area and proceeded to set up a small city. The other member of our party was someone I had not had the pleasure of meeting before, since he had only joined up with my sister's family a week or so before. 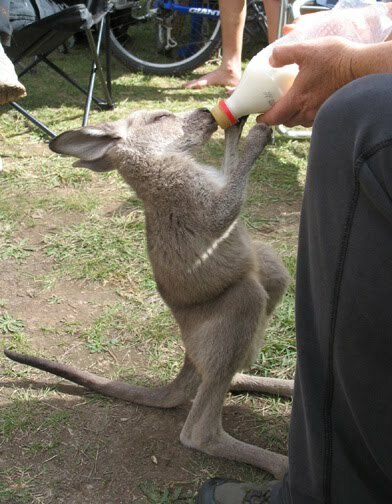 It was Androo, the impossibly cute orphaned western grey kangaroo joey. Alastair, my brother-in-law, is a vet, and was presented with this bundle of cuteness by a local in their area (SW NSW), and the family was now raising him before he is old enough to head out into the world on his own. I was deeply in love with the little guy from the first sight, and almost brought him home with me. The second camping trip was much quieter, just me and Anna, heading out more locally to a place called Wollangambe Crater. 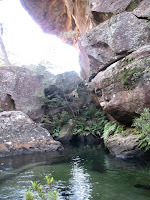 We had beautiful weather, only got a little bit lost along the way and had a perfect, flat, sheltered, isolated camping spot, complete with a truly irresistible swimming hole (very cold but worth the dip!). We cooked laksa for dinner, had a glass of red wine each and gazed up at the stars as we enjoyed the ideal way of steadfastly ignoring getting older. Other notable features of the month: finally installing the flue for the slow combustion wood heater in the new roof and completing the new guttering (both things I had been determinedly avoiding); putting in some replacement floorboards for my good friends John and Emma in their soon-to-be-opened new gallery (wish I could put a link to their shop but they won't let me know the name of it yet so I can't); getting a taste for abseilling by having a baptism of fire off a 25m cliff while kind of lost (again) in a beautiful gorge near Newnes. 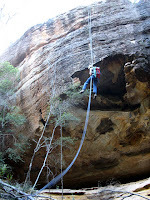 I was a bit nervous during the descent and had my hands rather concentrated on the ropes instead of managing a camera, so the photo is of Michael coming down, which I took after I had made it down alive. 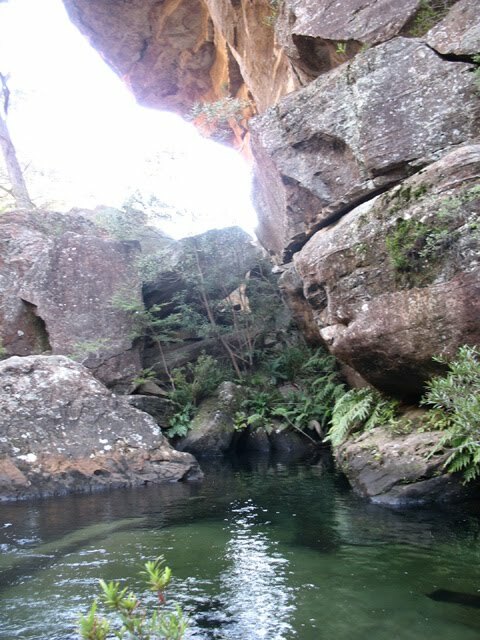 The water hole looks cool, i like camping trips in areas like that. I had a camping trip near a cave partially submerged in a river pretty cool, there were 2 more caves nearby one full of giant pythons and another filled with bats, awesome. 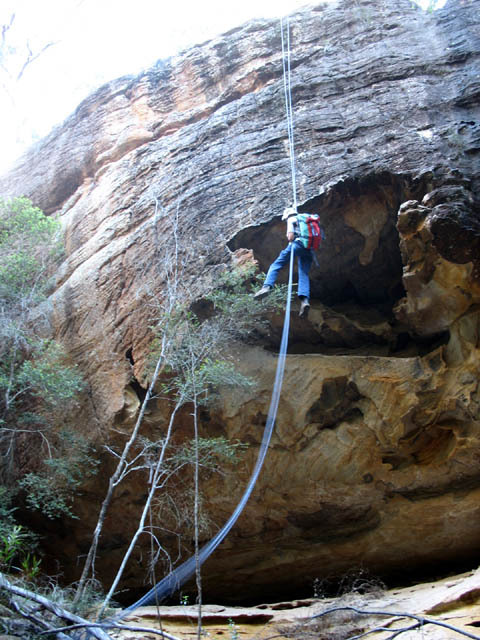 The drop looks scary, I wouldn't dare rappel as high as that. You installed new guttering? Should have tried this Easy Flow.